From its inception on Lady Day (March 25th) 1788 to the launch of the Rickmansworth Masonic School on 1st September 1978, the funding of the School depended on charitable donations, much of which – albeit not all – came from Masonic sources. An occasion dedicated to raising those funds was the annual dinner. Presided over by a senior Freemason, there was, in addition to the loyal toast, one made to the School “Prosperity to the Freemasons’ Girls’ School”. The assembled audience were appealed to for support in the venture – an appeal which never failed in its efforts. Throughout the nineteenth century, these dinners were reported in national and provincial newspapers. Indeed, Charles Dickens wrote about them in Sketches by Boz in the short story Public Dinners. The point was made, both for the diners and for the girls who were present, that the School offered support at any time during the girls’ lives. Naturally, the “healthy and happy appearance” of the pupils did much to promote their own cause but, in addition, the assembled diners were given verbal encouragement to support a cause of which they could boast, unblushingly, that every girl had turned out well. As well as a hearty meal for the assembled throng, there was professional entertainment provided. Often the girls performed songs and played music too. In the report from 1856, we are told that girls received prizes and then sang a hymn which had been written by two of them. The references to Mr Bolgna jun and Mr Bolgna sen are to John Peter Bologna (1775 –1846), known as Jack Bologna on stage, who was an Italian actor and dancer, and his father Pietro. 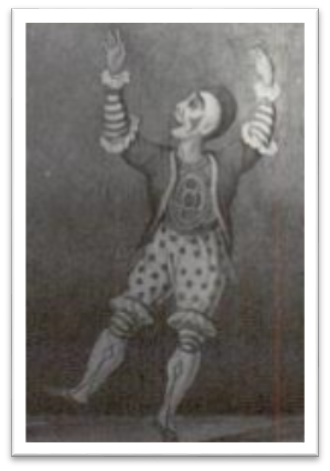 The phrase ‘clown to the rope’ referred to the compere who clowns about when the rope-dancer is not in motion and who comically fails to perform the tricks himself, thus demonstrating the skill of the rope-dancer. 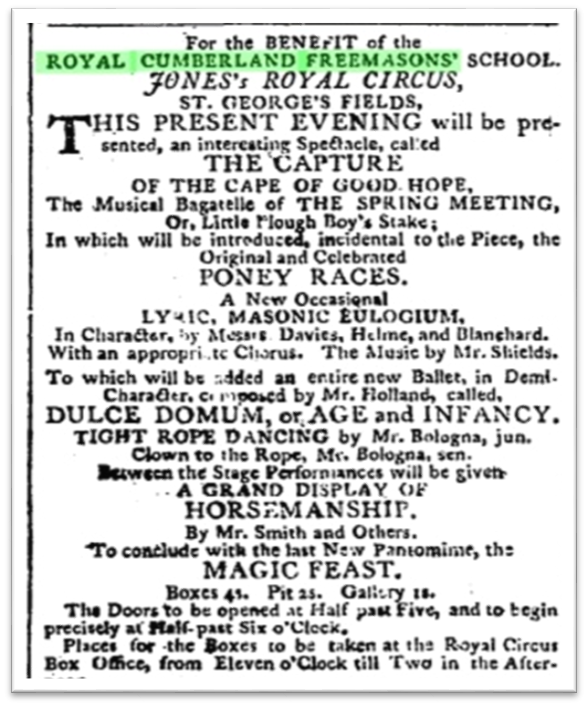 Drama, music, ballet, tight rope dancing, a pantomime – not to mention displays of horsemanship and, surely the highlight of the event, “poney races”. Two tickets for the pit please, can’t wait for it to begin. Please leave all time machines in the foyer.